The global mono Bluetooth headsets market has been thoroughly analyzed by Transparency Market Research (TMR). The research report covers market intelligence on mono Bluetooth headsets that includes analysis on major competitors operating in the market. The competitive analysis section includes analysis on various aspects associated with the key players, for instance, product synopsis, developments and innovations, key strategies, key personnel, geographical spread and other financials. These key players are continuously striving to grab a major portion of the market across the globe by expanding their footprint across regions. Companies such as MOTO, Widex A/S, GNNetcom (Jabra), Panasonic, Microsoft, Plantronics, Sennheiser, Samsung (Harman), Logitech (Jaybird), Bose and LG have been profiled in this research report. 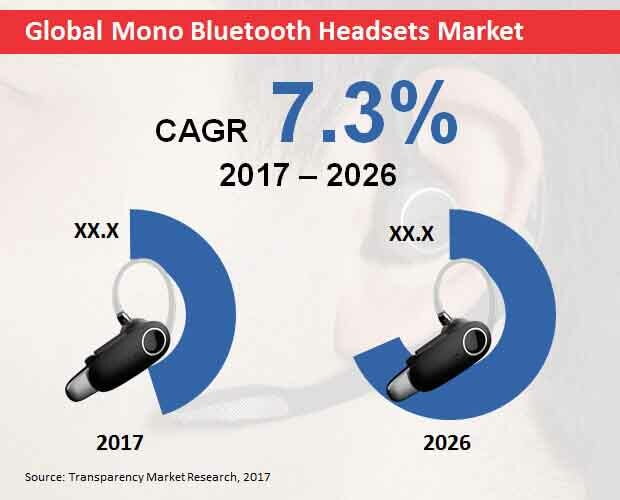 According to Transparency Market Research, the global mono Bluetooth headsets market is projected to grow at a value CAGR of 7.3% during the period of forecast to reach a significant valuation of more than US$ 6 Bn by the end of the year of assessment. The global mono Bluetooth headsets market is segmented on the basis of product type, application, distribution channel and region. With respect to region, North America and Europe are expected to show high market attractiveness in the coming years, with North America at the forefront. The mono Bluetooth headsets market in North America is estimated to reach a noteworthy market valuation by the end of the year of assessment. This market scenario in North America can be attributed to the increasing research and development in the technology sector associated with Bluetooth devices, increasing investments by number of players in developing new products and high per capita expenditure of people on mobile accessories. Europe region is expected to be the second largest in terms of market valuation. Mono Bluetooth headsets market in both North America and Europe regions is expected to grow at similar pace in the coming years. However, Asia Pacific excluding Japan (APEJ) region is expected to radiate high growth opportunities in the years to follow. In the product type category, the HSP (Headset Profile) segment reflected high market share in 2017. This trend is expected to continue over the forecast period and this segment is estimated to reach a high market valuation of more than US$ 2 Bn by end of the year of assessment, thus leading the global market. Moreover, the Advanced Audio Distribution profile (A2DP) and the Hands Free Protocol (HFP) segments are expected to grow at a significant pace during the forecast period, however the latter is expected to showcase comparatively higher market strength and growth rate in the coming years. The adoption of Hands Free Protocol (HFP) is expected to increase at a high rate during the forecast period. This segment is thus anticipated to showcase high growth potential for mono Bluetooth headsets market. With respect to application, the use of mono Bluetooth headsets for communication purposes has been increasing. The communication application segment is estimated to be the largest and is expected to dominate the global market. On the other hand, the sports segment is projected to expand at a high pace to register a value CAGR of 7.4% throughout the period of assessment. By distribution channel, the multi branded stores segment is the largest with high market share and is expected to touch a value of about US$ 2300 Mn by the end of the year of assessment. In close competition, is the exclusive stores segment with a similar valuation, however a shade below the multi branded stores segment. The sales of mono Bluetooth headsets via multi branded stores and exclusive stores has been higher across the globe as compared to online sales channel and hypermarkets/supermarkets. However, the online sales channel is also expected to gain traction in the coming years.